'Strawberry Orangeade' is an easy to make drink in a jiffy using the home made strawberry syrup. Simple delicious and it almost tastes like a sharbath. The colour of the juice remains almost the same after adding the strawberry syrup too. If you use Mosambi (sweet lime) you will get dark orange colour. But you can feel the difference in taste in this juice. You can able to taste the flavours of both the fruits. The orange flavour dominates and the strawberry syrup gives little kick to the juice and transform the simple juice into next level. Click here to get the strawberry syrup recipe. Super simple to make with very limited ingredients with simple procedure and quench your thirst in Summer season !!! Extract the orange juice from the oranges using normal citrus juicer or squeezing by hand. 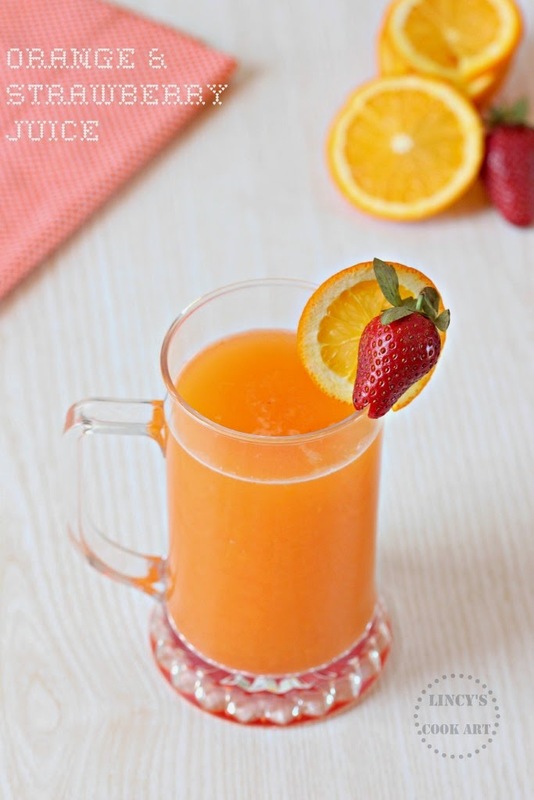 Add almost equal quantity (approximately 2 cups) of chilled water with this orange juice. Pour the strawberry syrup 2-3 tablespoons according to your taste and mix well with a spoon.